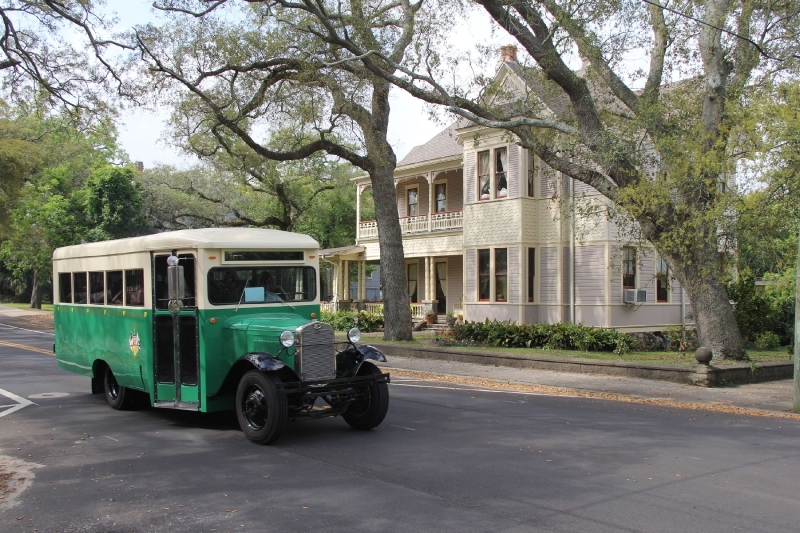 Tour with Go Retro–the longest operating historic tour company in Pensacola. Our tour lineup and knowledge of staff are second to none. All our tours are entertaining and educational. Some involve lots of walking (Civil War) or eating (Tasting Tour). Some offer moderate walking (Hop-on Hop-off). Then others involve light walking (Landmarks, Red Light). Others are just scary (Ghosts and Graveyard, Cemetery Walking). There is something at Go Retro to appeal to your interests or satisfy your curiosity. — Hop-on Hop-off (daily, Tuesday through Saturday)–Ride a loop in greater downtown Pensacola. Explore places at each of the 14 stops, and receive over $100 worth of coupons to use along the route. — Landmarks (Tuesdays and Saturdays)–See the sites that characterize Pensacola and define this historic city. — Civil War (Thursdays and Saturdays at 10:00)–Learn how the war almost began here. Climb to the top of the Pensacola Lighthouse, which was bombarded by the Union, and walk through Ft. Barrancas, one of the best preserved Civil War era forts in the nation. — Ghosts and Graveyards (Thursdays and Saturdays)–Be spooked as you travel in downtown neighborhoods and 19th century graveyard. — Red Light (Wednesdays and Fridays)–Explore the city's debaucherous past when prostitution was legal and then not. Learn how you can have a better love life. Tour a former brothel and have an alcoholic drink downstairs. — North Hill (Tuesdays and Fridays)–See Pensacola's first upscale neighborhood from bungalows to mansions. Tour a period house too. — Tasting (Tuesdays and Thursdays at 3:30)–Learn about the city through its foods and stories in a walking tasting tour down Palafox St. However, there are other tours, which are less popular (i.e. Architecture, Beach, Andrew Jackson, Historic Pensacola, and Cemetery Walking). –Naval Heritage–An overview of the military's importance in Pensacola, followed by a guided tour of the Naval Aviation Museum, and lunch at the Cubi Bar–a replica of a famous military bar overseas. –Adventure–Immerse yourself into Pensacola, seeing sights, touring key downtown museums, exploring a Victorian home, and having a wine tasting at a winery. –Civil War–A more in depth examination of the Civil War, which includes exploring important sites like Pensacola Lighthouse, Ft. Barrancas, and Ft. McClellan. –Red Light–A light hearted look into the oldest profession, this tour includes a visit to Madam Mollie McCoy's grave, former brothels, and alcoholic drinks. Go Retro also partners with the Pensacola Pass, which is the best tour package available. For one price, it includes the Hop-on Hop-off tour, Historic Village and four downtown museums, Dolphin Boat Cruise, Pensacola Lighthouse, and simulator ride at the National Naval Aviation Museum. All Go Retro's tours are insightful and fun. Become transfixed, absorbed, engaged, and most of all, entertained. You'll be glad you went retro! VIVO – West Bay (9.1 miles) – The word VIVO originates from the Latin vīvō and means 'to live' or 'to be alive'…. You are submitting a booking enquiry. Go Retro Tours will then contact you by email with details of availability and prices.